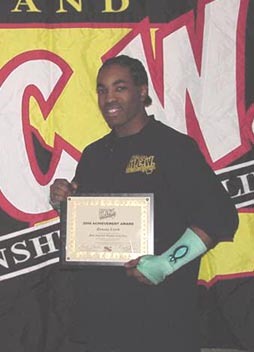 January 30, 2002 Maryland Championship Wrestling: Qenaan Creed defeated Joel Maximo and Amazing Red in a 3-WAY. February 16, 2002 Maryland Championship Wrestling: Qenaan Creed defeated Ronnie Zukko to retain the MCW Cruiserweight title..
March 27, 2002 Maryland Championship Wrestling: Amazing Red defeated Qenaan Creed to win the MCW Cruiserweight title. April 20, 2002 Maryland Championship Wrestling: Amazing Red defeated Qeenan Creed in Ladder match to retain his title. May 22, 2002 Maryland Championship Wrestling: Amazing Red defeated Qenaan Creed to retain the MCW Cruiserweight title. June 15, 2002: Jersey Championship Wrestling (Jersey Cup): A.J. Styles defeated Qeenan Creed..
June 21, 2002: Romeo Valentino defeated Qenaan Creed..
July 17, 2002 Maryland Championship Wrestling: Amazing Red beat Qenaan Creed to advance in the Shane Shamrock Memorial Cup. September 18, 2002: Church & Genesis defeated Qenaan Creed & Brock Singleton..
May 15, 2003: Danny Doring defeated Qenaan Creed..
January 29, 2004: The SAT & Qenaan Creed defeated Slugger & The Slackers (Chad & Dino)..
December 26, 2004–New Milennium Wrestling: Quenaan Creed beat Johnny Thundar to retain the Cruiserweight title..
June 4, 2005–Jersey All Pro Wrestling: Steve Corino defeated Qeenan Quinn..
June 5, 2005–Independent Championship Wrestling: Qenaan Creed defeated Derek Frazier and Josh Daniels in a 3-WAY..
March 26, 2006–Maryland Championship Wrestling: Queenaan Creed defeated Doug Delicious..
April 22, 2006–Maryland Championship Wrestling: Derek Frazier defeated Qenaan Creed to retain the Cruiserweight title..
July 9, 2006–Maryland Championship Wrestling: Steve Anthony beat Qenaan Creed in the 1st Round of the Shane Shamrock Cup..
July 22, 2006–MCW: Josh Daniels beat Eddie Edwards & Queenan Creed & Danny Jaxx in a 4-WAY to retain the Rage Television title! September 10, 2006–Maryland Championship Wrestling: “The Technician” Tom Carter defeated Queenan Creed..